Who says only dogs can look trustful? It's hard to resist the looks these cute cows give you - just like the dopey-looking magnetic sheep. Both articles also make for wonderful gifts - two thumbs up! Got milk? The little cows love a glass of milk! A small but strong neodymium magnet helps the cow hold up vacation greetings. 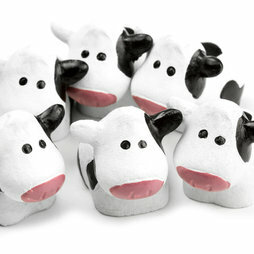 Six cow magnets are delivered in this packaging.